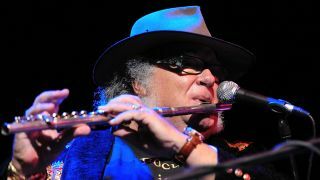 Focus frontman Thijs van leer has spoken out about the current state of of the progressive rock world in an outburst in the new issue of Prog Magazine. Whilst discussing the band's 50th anniversary and the new Focus album Focus 11, which is out now, Van Leer lambasted today's progressive bands as largely regressive. “I don’t believe in the words ‘progressive rock’, sorry because your magazine is called that,” the Dutchman said. "I think the only progressive rocker we ever had, who unfortunately died, was Frank Zappa, because he combined modern classical music, which he composed himself, with rock and that, to me, was progressive rock. Focus 11 is on sale now. The band are currently on tour in support of the album (see the Focus website for dates). The new issue of Prog Magazine is on sale now. You can buy it online here.